Our Synthetic (Faux) Mink Lashes for Semi-Permanent Eyelash Extensions are soft, light, and natural looking. These individual synthetic single lash extensions are available in lengths from 8mm-14mm and in thicknesses of .15mm, .20mm, and .25mm. This glam ready tray contains approximately 4000 ONE-BY-ONE C-CURL Mink Single Lashes (in .25mm thickness) used for Semi-Permanent Mink Eyelash Extensions. .20mm - Provides fabulous result with denser lash thickness. .25mm - Provides thickest lash look for ultimate glam. 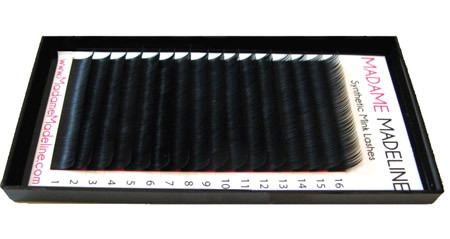 C-Curl mink eyelash extensions has a more pronounced curvature than J-Curl lashes. C-Curl lashes resemble curled natural eyelash with an eyelash curler. C-Curl and D-Curl mink extensions blend well together for a defined curly look. Mink eyelash extensions is one of the hottest Hollywood beauty trends for fashionistas who want to have long, bat-worthy lashes like Beyoncé and Kim Kardasian. Celebrities have known about this trend for years as a way to add length and volume without messy masacara. Our feather soft faux mink lash extensions are applied individually on top on each natural lash one lash at a time. They are long lasting and different from traditional individual lashes that come in lash clusters.